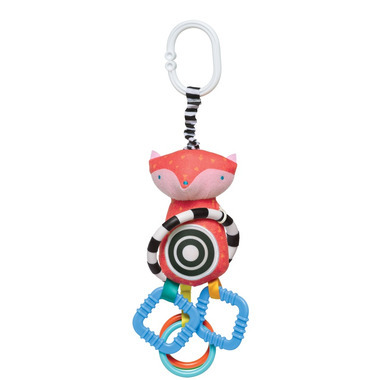 This on-the-go activity toy has engaging features that include teethers, crinkle sounds and clacking rings that will delight baby while assisting in the development of fine motor skills. Pull the fox down and it will jiggle which fosters cause and effect learning. Easy to attach to strollers and diaper bags. I would highly recommend this car seat toy. My 3.5 mo son played with it right away. The two different lengths of rings mean he can grab the shorter ones and fit the longer ones into his mouth. He's just figuring out that he can pull the toy down as well and it vibrates. Cute and as pictured. Its nice and long so it sits in their lap while in carrier and does not swing at their face. Bought this for my 3 month old. Very cute, and my 3 month old really likes to grab on to the rings! Great toy! My 4 month old twins love to tug and chew on the rings. Too bad I only got one because they fight over it on their playmat!